One of the best parts about Comic-Con for real genre fans is the opportunity to walk through the autograph area and catch a glimpse (or a signature) of someone whose work you’ve enjoyed on TV or in the movies for years. For us, that walk also allows us a chance to score interviews with such people. 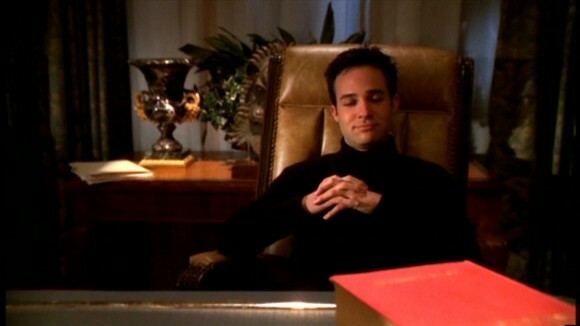 And really, for a site like Fanboy Planet, can there be a better get than one of the Buffy villains known as The Trio? 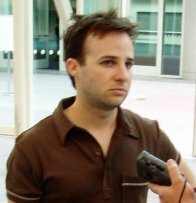 Though Danny Strong had made appearances on the show since the beginning, it was the sixth season that really brought out the part of his character that made him, now and forever, one of us. Did we not all cringe when Spike threatened his limited edition Boba Fett figure? Might as well just kick us in the crotch. Derek McCaw: Now that Buffy is all over, what do you have lined up next? I know your fans are going to want to know that. Danny Strong: Sure. I am going to be in Seabiscuit. I play a jockey. Go figure. I’m going to be doing an animated pilot for Nickelodeon, which I’m really excited about, with Tom Kenney, who’s the voice of Spongebob. If it gets picked up it will be really cool. It’s a very funny show. And just my own projects that I write. Trying to get some of those going. DM: Have you done a lot of voice-over work before? DS: Yeah, I have. I’ve done a lot of radio commercials. And I did an animated pilot for Fox this year that didn’t get picked up. But that’s it. Wait – I did some stuff on Hey Arnold! years ago, but nothing that big. DM: On to the Buffy questions. How did you feel when you got the script that said you were going to die? DS: Ah, I was really disappointed. I always thought that Jonathan would be the long-time survivor. DS: Yeah, I didn’t think Jonathan was going to get it. But he sure got it. I was definitely disappointed, but you know, that’s the way the cookie crumbles. It was a great five years. And at least if I’m going to get killed, it might as well be in the show’s last season. DM: Very good point. Did you want Jonathan to have the obsession with Warren? DS: No. I thought it was much better for Andrew. DM: Do you feel that having played Jonathan makes you the lord god king for the geeks to aspire to? DS: Well, I don’t know. Not really. Not really. I never thought of him as such a geek. Even though he was a geek. I didn’t think that his geekdom was what identified him. For me, it was his desire to be one of the gang, his desire to be an insider, as an outsider. Which you could interpret as geeky. I felt the season six arc, the one with the trio, you know, when they did have all that geek jargon, quote unquote, that wasn’t really the sort of Jonathan we’d gotten to know up until then. DM: And how much of that geek jargon were you familiar with? DS: Do you really want to know? DS: Is it going to hurt your feelings? DS: Not one line. Didn’t know one line of dialogue. It was all explained to all three of us, even though Tom Lenk (Andrew) claims he didn’t know any of it, but he did. He knew all the Star Wars references. DM: What was your proudest moment on Buffy? DS: My proudest moment? I really enjoyed Dead Things, that episode when we killed Katrina. I felt like we were all really focused. There was some really tense stuff, and I put a lot of work into that. You know, I put a lot of work into Superstar, too, which was really challenging and difficult. I was sort of caught up with…that was actually more difficult than fun. Everyone always thinks that must have been the coolest thing ever. It was cool, but it was really trying to figure it out the whole time. It’s not as fun when you’re kind of behind it. 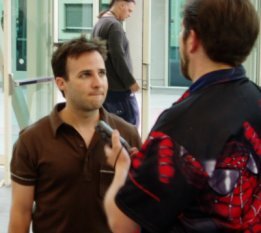 DM: When you showed up in the first season, did you ever think your character would become what he did? DS: How could anyone think? It was just kind of going with the flow, and the flow turned out good.